Cask at the GBBF 2018 day 1 07/08/2018. A nut brown red coloured pour with a halo of beige tan head. Aroma is fried fruit, dried nuts, faint powdered choc. Palate is dry grains, lowish carbonation. Flavour is roasted nuts, raisin, cakey malts. Decent. Cask at GBBF '18, day 1, 07/08/18. Light black with a moderately appointed beige cap that thins to a swirl. Nose is toffee, stewed fruits, tobacco, light spice. Taste comprises fruit slice, dried fruits, grains, biscuit, brown bread. Medium bodied, soft carbonation, drying close. Ok.
Cask at GBBF 2018. Black. Roasted malt aroma with coffee and tobacco. Dry, low to medium bitterness. Cask at GBBF 2015. Deep brown black colour. Very aromatic. Chewy fruit, malt loaf, liquorice. Enjoyed this. Cask (handpump) @ GBBF 2013, Great British Beer Festival, London Olympia, Hammersmith Road, London, England W14 8UX. 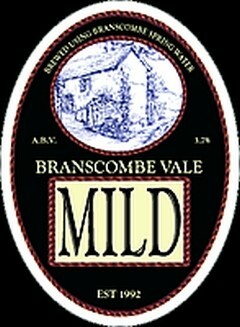 [ As Branscombe Vale Mild ]. Cask conditioned at The Wellington, Birmingham. Dark brown with cream head. Initially smooth and quite malty, easy drinking then with a light bitterness coming through and a hint of fruitiness. A decent enough Mild.